In literature, there is some disagreement about the structure of the lamina muscularis mucosae (lmm) and the position of the proventricular glands. According to some autors, the glands are located between an inner and outer layer of the lmm, the latter being much thicker. 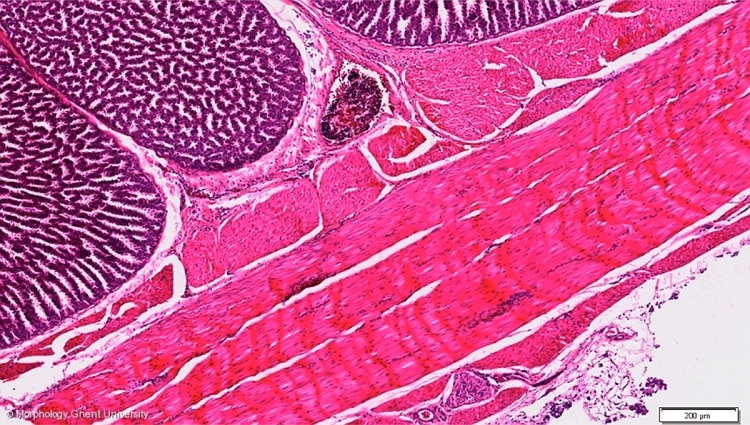 The t. submucosa thus is a narrow connective tissue layer, sandwiched between the outer layer of the lmm and the circular layer of the tunica muscularis. Others divide the glands into superficial glands located in the l propria and deep glands located in the tunica submucosa but don't describe the (position of) the lmm. On this picture, the first theory is followed.